The New York Democrat, 52, told late-night talk show host Stephen Colbert that she was filing the paperwork to explore a run "for president of the United States tonight!" A clip of her taped interview was released to the press ahead of "The Late Show with Stephen Colbert," which airs on CBS. "I know I have the compassion, the courage, and the fearless determination to get that done," she said. Filing paperwork with the Federal Election Commission for an exploratory committee will allow the senator to raise and spend money like a presidential candidate, before officially entering the race. Candidates are supposed to take this step within 15 days of raising or spending more than $5,000 on a potential bid. Gillibrand has been hiring campaign staffers, renting out a campaign headquarters, and is reportedly planning a trip to Iowa this weekend, according to reports. 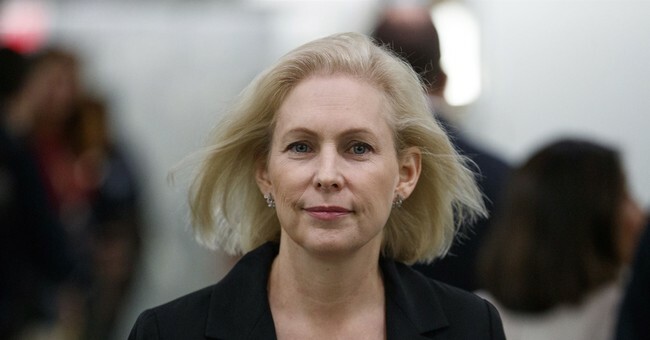 Gillibrand's campaign will focus on her as an advocate for families and the disadvantaged, a leader on transparency in politics, and a fierce opponent of President Donald Trump, a campaign official told NBC News on Tuesday. Yeah, everyone thinks they can take on Trump. Rep. Tulsi Gabbard (D-HI), Sen. Elizabeth Warren (D-MA), former San Antonio Mayor Julian Castro, and Sen. Kamala Harris (D-CA) have all made similar announcements, or are expected to make them in the coming days. The Democratic 2020 field was going to be a clown car—and it just got bigger. Most of those running don’t have national name recognition, they’re not well known past their local bastions of support, and that doesn’t bode well for a national campaign right now. Most of the candidates coming out of the woodwork to take on Trump are from the most liberal areas of the country, which tells you how these primaries are going to go. So, who do you think will have "abolish ICE" on their campaign website first?